Nutritious vegetables used in Filipino dishes like kalabasa, talong, sitaw, okra, ampalaya, papaya are cherished comfort foods and tasty. Let’s get real here, no matter how much we try to eat healthy meals and exercise regularly, we are all still vulnerable to sickness during the flu season. All you need is a co-worker to sneeze somewhere around you and their cold goes viral! And moms and dads, I don’t need to go into detail about what germs our children bring home with them. We are almost at the tail end of the brutal flu season according to the Center for Disease Control. The overall number of flu-related hospitalizations went up to almost 86 people for every 100,000 in the ninth week of 2018 in the U.S. Here in Hawai‘i, the rate of outpatient visits was at 7.4% compared to 4.5% last year. Hawai‘i closely followed the national average. On week 10 of the flu season, 6.5% of all deaths in Hawai‘i were related to pneumonia or influenza. It’s not a big surprise that a large number of the work force in Hawai‘i experienced some form of cold and cough symptoms. Even the typical healthy person managed to catch mild body aches and fever. This means many stayed home and a lot of chicken were sold. Some of the highly recommended foods to boost your immune system and help with recovery are: garlic, beef, sweet potato, turmeric, dark leafy greens, wild salmon, and chicken soup. Vegetables like paria, or bittermelon, and local parsley are used in this version of chicken paria—an Ilocano variant of chicken tinola. This plating shown is by Manong Tante of Tante’s Island Cuisine. One of the more popular go to dishes for the cold season is chicken soup. This is true both in the U.S. and Philippines. Chicken soup varies from place to place, depending on the ingredients available. A typical American chicken soup recipe includes: chicken meat, chicken broth, carrots, celery, onion, bay leaf and white rice. Filipinos also have their own version of chicken soup known as chicken tinola. 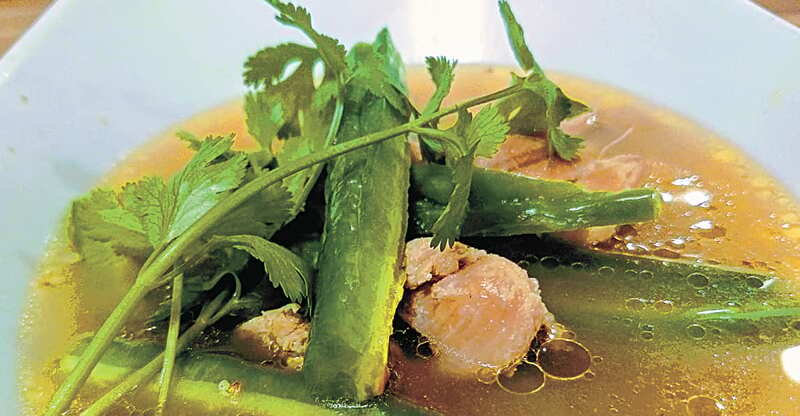 Tinola is a soup base comprised of the Holy Trinity ingredients, garlic, onion and ginger. Each region has their own version of chicken tinola depending upon the availability of their go to ingredients. 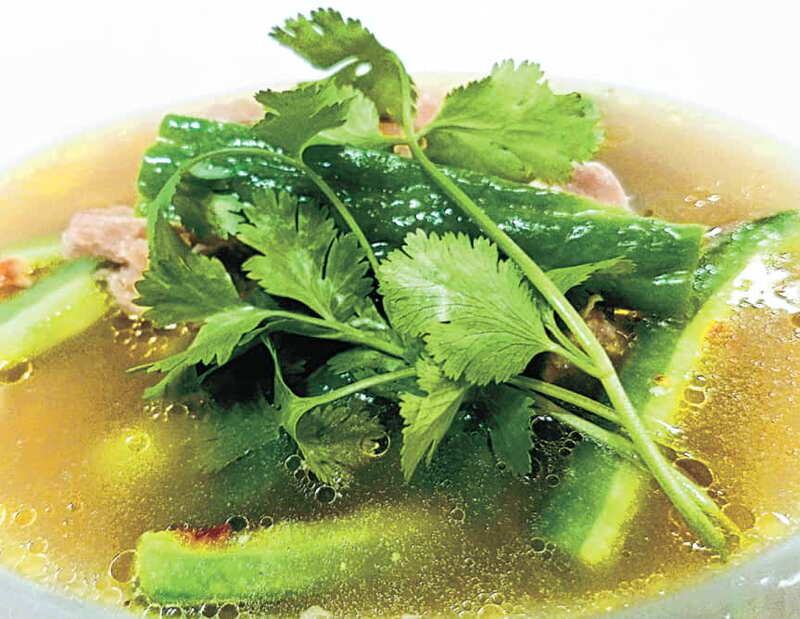 From the soup base, additional ingredients can be added such as green papaya or sayote, petchay or baby bok choy. So what differentiates the Filipino comfort soup to that of a typical American recipe? Well, the ingredients of course! Super Foods such as dahon ng sili, malunggay, ampalaya also known as paria or bitter melon. Now talk about packing a punch to the taste with that one! But you have to convince the kids that it’s extremely good for the body to get them to even taste. Dahon ng sili—or chili leaves—unlike the fruit is not spicy at all, is an excellent source of calcium, iron, phosphorus and vitamins A and B. Malunggay in Tagalog or Marunggay in Ilokano (Moringa oleifera is the scientific name) is often referred to as a miracle tree as it’s known to be packed with vitamins and other nutrients used for both nutritional and medicinal purpose. 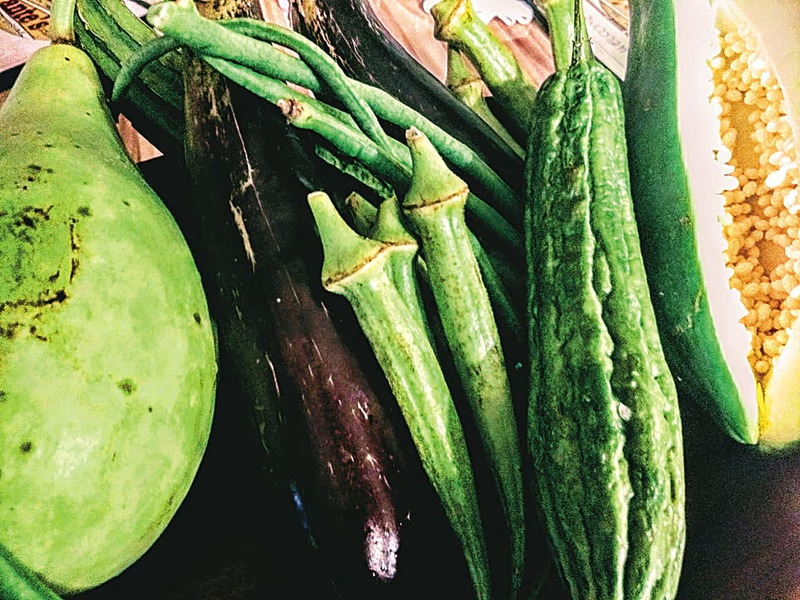 Another secret ingredient to add is Ampalaya in Tagalog or more commonly known as Paria in Ilokano—Momordica Charatia is the scientific name. This gourd has a bitter taste due to the presence of momordicin. Ampalaya is widely used as an herbal remedy to lower the blood sugar levels for diabetic patients. It is also used to help alleviate symptoms of fever, headache and body pains and the list goes on. A personal favorite ingredient in tinola is ginger. The root of the ginger plant can be consumed fresh, powdered, dried, oil form or juice. Ginger is part of the Zingiberaceae family, alongside cardamom and turmeric. As a child, this was what my grandmother used as lozenges for sore throat, the first sign of sickness. In tinola, it’s a must ingredient alongside whatever may be available with the chicken tinola recipe. If you are from Metro Manila, your chicken tinola soup includes: chicken, green papaya, dahon ng sili, garlic, onion, hot peppers, ginger and patis, or fish sauce, for the salty flavor. You are most likely from Ilocos if you would much rather a bowl of chicken paria, which features the paria as the main star ingredient of soup. I have only seen the paria soup served in one restaurant here in Maui, and that is at Tante’s Island Cuisine. I frequented a few local Filipino eateries but no luck in finding ingredients such as paria, marunggay, or dahon ng sili. Hopefully, Manong Tante and others will consider including marunggay in his menu. One can only wish! 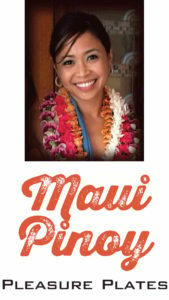 I will continue my quest to find delightful and healthy Pinoy dishes around Maui. Whereever you may be from or whatever your go to ingredients may be for your chicken soup, one thing is certain—it is more enjoyable when someone else cooks it for you. Enjoy chicken tinola and stay healthy!